Swedish cartoonist and illustrator Lasse Sandberg and teacher and author Inger Sandberg met in the 1950s and started their successful collaboration as a creative team and married couple. Outside the Nordics they are probably best known for their books about Little Anna and Little Ghost Laban. 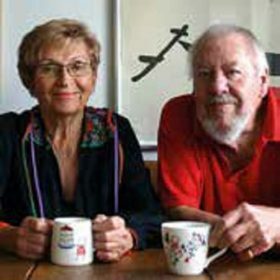 Together Inger and Lasse wrote and illustrated over 100 books and have been nominated and awarded several prestigious prizes, including the Astrid Lindgren prize and Elsa Beskow plaque.